The suppliers are one of the most important assets of the organization and have an important influence on the supply chain, the production and therefore on the service and sales. Hyper has a suppliers module which allows its users to manage the suppliers of the organization. The system provides all of the required information about the suppliers, and includes a general information, contact details, relationship log, related documents, purchase orders and accounting. The system allows the user to simply follow the supplier activity and relationship with the organization. The main page of the suppliers module allows to search for a required supplier, choose a supplier from the result table and open his card, or create a new supplier card, as described below. At the top of the suppliers tab, there is a searching field, allows to search for existing suppliers of the organization. In order to search for a required supplier, fill in one of the identifying details (Name / Phone / Email / ID Number) and press the Search button. Filling in a partial identifying detail, will display all of the suppliers cards that contain this content in one of the identifying fields. Alternatively, the system allows to use the Search Wizard button, to create a customized filter according to the users needs and the organizations requirements. This wizard allows to create permanent filters, that will be available to any user according to authorizations. The table in this window displays the searching results. This table displays all of the suppliers cards that contain the required identifying details. Each row represents a different supplier card as well as general information about this supplier: Full name and status, Relationship abstract, Last phone call date and time and whether this supplier is defined as a middleman. The user can choose to display additional or different information fields and define the Fields Layout and Rules, according to the needs and the requirements. - New Supplier. This status is updated by the system to any new supplier. - Follow Up. This is the status of a supplier after the first contact with the organization representative. This supplier is not approved by the organization yet. - Real Supplier. This status in manually updated, by choosing the "Set as Real Supplier" handling status in the Relationship tab of this supplier card. - Problematic (Read Notes). This status is defined by the user for a supplier with a current status of "Real Client". Please note - When choosing this status, the user needs to fill in a note regarding this status, that will pop up when opening the supplier card. 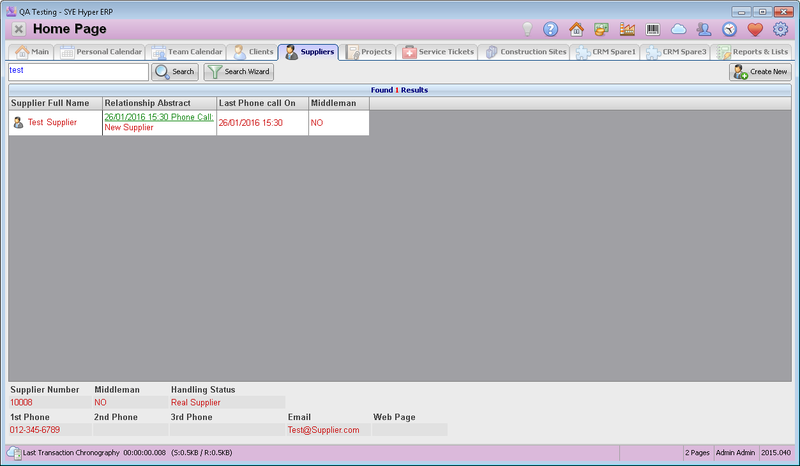 that Click on a supplier record to display more information fields at the bottom of this window. 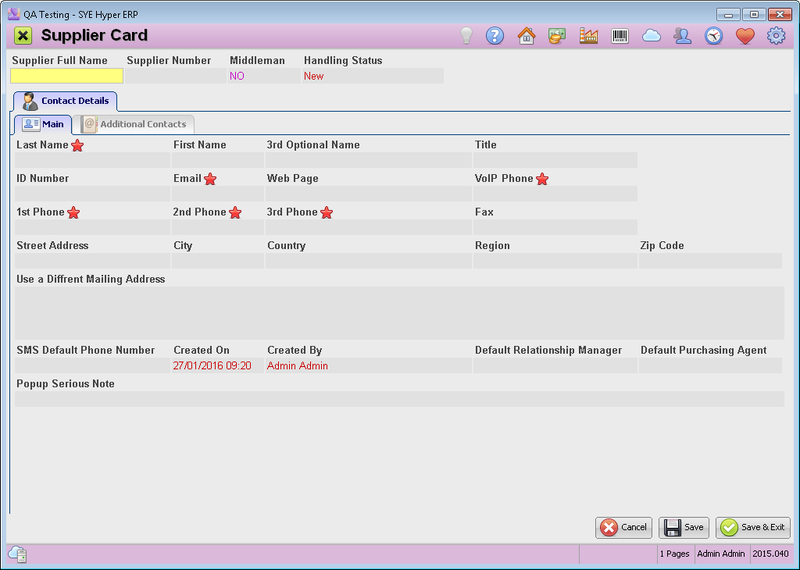 Double click on a supplier record to open its Card. In order to create a new Supplier card, press the Create New button. Supplier Full Name This field contains the Last Name and the First Name of the supplier. Supplier Number An automatic and unique supplier number, given by the system. Middleman Any supplier can be defined as a Middleman. This supplier will be available to defined as a Middleman in the organization's clients cards. Handling Status The current status of the supplier. Contacts list - The list of the contacts sorted by the Agency / Division. contact details - Contact details and general information about the contact person. Additional information about the information fields can be found at the bottom of this page. Please Note - mandatory fields are marked with . Add a new contact person. Send an Email message to the contact person. Send SMS message to the contact person. Create a new meeting with the contact person. Print the details of the contact person on an envelope. Copy the details of the contact person to the clipboard. The access to suppliers card can be approved or denied, according to the authorization of the user.